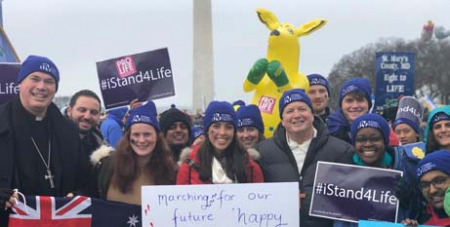 Bishop Umbers said he was in Washington to both protest against abortion and to understand the logistics of the world’s largest pro-life gathering, with hopes for staging a March for Life in Australia. “The influence of the United States is ever greater, especially with the internet and social media - for good and for bad - but we’re looking to take from the good,” said Bishop Umbers. When it comes to the abortion debates, he believes there are important similarities and differences between Australia and the US. And while the American and Australian legal systems inform and shape public debates over the issue, at the heart of it he believes is “a clash of visions,” about the human person that divides society over concern for human life. Bishop Umbers is in Washington with a group of 120 young people from the Archdiocese of Sydney, which is part of the delegation of 200 en route to World Youth Day in Panama. He’s hoping that their experience at the March for Life will serve as further evidence that they’re not alone in caring about life or their Catholic faith. “Something like the March for Life gets very little coverage back in Australia so it’s important for them to see that sea of young people and say, ‘I never knew,’” he said. While official crowd figures are not available, an estimated 100,000 people were expected to attend Saturday's march, Catholic News Service reported.